For millennia, Morocco has been the epicenter of an exchange of culture, trade and influences, with empires and nation-states like Rome, Phoenicia, the Umayyad Caliphate, France, Spain and the Berber Dynasties having left their marks on the makeup of modern-day Morocco. The Moroccan landscape runs the gamut, ranging from Atlantic Ocean and Mediterranean Sea coastlines, snow-flecked mountains, and the edge of the Western Sahara desert. Morocco has a distinct blend of Old-World and New-World charm to it, with its pulsing cosmopolitan life, and the architecture and customs that harken back in time. Through time, the area of North Africa that is present day Morocco has had a litany of different cultures and empires attempt to secure all that this region has to offer, ending in a modern Moroccan independence. Because of its location along the Mediterranean Sea and Atlantic Ocean, this region has always been a sought-after prize. After centuries of competing Empires such as Carthage and Rome occupied the region, in the 700s, the Golden Age of Islam swept over the region and established an Islamic presence that is still very evident today. After expelling foreign occupation in the 16th Century, The Berbers, the indigenous ethnic group in North Africa, gain control of their own lands. Different Moroccan dynasties have ruled, especially the Alaouite Dynasty, belonging to the royal family that is in power in Morocco to this day. In 1912, with the trend of European Colonialism, the French annexed Morocco and was under French occupation until 1956, when Morocco overthrew the yoke of colonialism and gained independence. Size (land area): 172,394 sq. miles. Morocco is slightly more than three times the size of New York; slightly larger than California. Elevation Extremes: Lowest point: Sebkha Tah (-34 miles below sea level). Highest point: Jebel Toubkal (2,588 miles above sea level). Religion: Muslim 99% (official; virtually all Sunni, <0.1% Shia), other 1% (includes Christian, Jewish, and Baha'i); note - Jewish about 6,000. Morocco requires U.S citizens to carry a valid U.S passport when travelling to Morocco. A visa is not required for U.S travelers whose stays won’t exceed 90 days in a six-month period. Morocco is a country in the Maghreb region of North Africa; its coastlines border the North Atlantic Ocean and the Mediterranean Sea. Territory of Morocco covers 446,550 sq km (172,413 sq miles), consisting of 446,300 sq km (172317 sq miles) of land and 250 sq km (96 sq miles) of water. The currency in Morocco is the Moroccan dirham. The dirham is a currency that is divided into 100 satim; 100 satim equal 1 dirham. The denominations of dirham come in banknotes of 20, 50, 100 and 200. The currency is also divided into 1, 5, 10, and 20 santimat coins, and ½, 1, 2, 5, and 10 dirham coins. Given that Morocco is a very devout Muslim country, with 99% of the Moroccan citizens practicing Islam; modest clothing on your part will definitely be a factor in the interactions that you will have with Moroccans. What western countries consider casual clothing; Muslim countries like Morocco might find it distasteful and even disrespectful. It is advised that women wear clothing that covers the knees and shoulders. We would suggest long skirts or dresses, pants or jeans. For men, it is normal to wear pants or jeans with a collared shirt. Sunscreen and sunglasses are a must when visiting Morocco because of the powerfully sunny days. 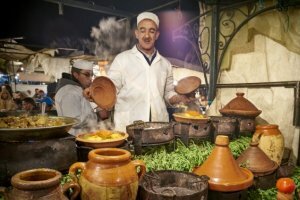 The historical significance with different cultures holding sway over the area through the centuries and being in the prime location for cultural exchanges in the Mediterranean Sea area; Moroccan cuisine is a patchwork of Berber, Mediterranean, Arabic, Sub Saharan and European influences. The cuisine is known to a number of spices to enliven their dishes that dance on your palate, and leave you wanting more. The spices include cinnamon, cumin, paprika coriander and saffi dried ginger. The staple Moroccan dishes include Couscous; considered a Moroccan delicacy, Couscous features meat that is stewed with a variety of vegetables. Stews or Tagines are very common in Morocco, with fish or meat, accompanied by vegetables. If you find yourself parched, try Moroccan Avocado juice or Khoudenjal Tea, a ginseng drink with a spicy accent to it. Morocco has a varied climate that is moderate, Mediterranean along the Moroccan coastlines, subtropical nearing the interior and extreme temperature near the Western Sahara. 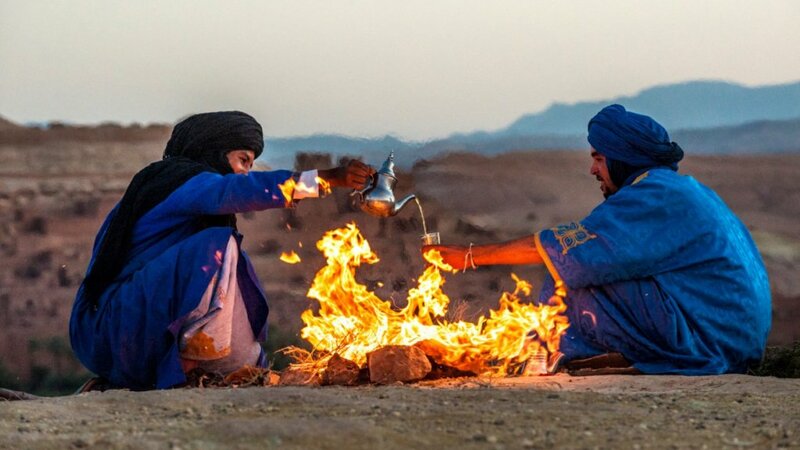 The average temperature in Morocco is 86°F (30°C) , and reaches upwards and beyond 100°F (37.5°C) often. The nighttime temperatures can drastically drop in the Sahara region, nearing 5°C (41°F). The most ideal time to visit Morocco would either be during the spring, in between March and May; as well as during the early autumn time, between September and October, because the temperatures are mild and enjoyable. Along the coastline in the North and West, the Moroccan weather is that of the Mediterranean Sea, with warm and dry summers; and moderate winters. It is reported that 95% of all Moroccans live in the North-western area of the country. In cities in the North-Western coast like Rabat, experience averages of 70°F to 80°F in the summer and 62°F to 69°F in the winter months. This area has an arid and desert climate that experiences little to no rain. The summer heat in this region can be extreme, and the winter nights can be frigid. In the winter months, the daytime temperatures can be enjoyable, reaching 65-70°F. The summertime temperatures in this region can be uncomfortable and blazing, reaching averages of 115°F. Founded in 1062 by the Berber Almoravid Dynasty, Marrakech is the third largest Moroccan city and known as one of the great centerpieces of the Muslim world. Wedged between the wondrous Atlas Mountains and the outskirts of the Sahara Desert, Marrakech has backdrops that few places can compare to. Djemaa El-Fna square in the Medina is the heartbeat of the city that is brimming with people, night and day. The din of human activity can always be heard with shouts from welcoming stalls, musicians, street-performers and story-tellers. Visit the Souks or bazaars where wares of every type are sold, including ornate carpets, tea pots, clothing and spices. Experience the enchanting architecture and atmosphere of the Kasbah district, with the Royal Palace and the tombs of the Sultans of old. Marrakech or “the Red City” was once the capital of Berber Dynasties for a reason and it’s a sight to behold. Touting nicknames such as the Mecca of the West, the longstanding walled city of Fez has been described by many as akin to the captivating city of Jerusalem. Fez is truly a great achievement in Islamic culture. A hotbed for education and religion for centuries, Fez is home to the world’s oldest operational university, The University of Al Quaraouiyine. The 9,000 alleyways and streets that are the true arteries of the city introduce visitors to breathtaking mosques, marketplaces, and classic Islamic architecture. The medina of Fes el-Bali is renowned as being one of the largest car-free urban pedestrian places on the planet, which gives visitors the pleasure of freely exploring the area without the annoyance of cars interrupting their experience. The grandeur of this imperial city will leave a lasting impression on those who visit. The largest desert in the world, with an equivalent size of the continental United States, cuts a 3 million square mile swath of sand across the north of Africa, and touches about 10 different African nations. Morocco is a gateway to the sprawling Western Sahara. Feel the experience of being a desert trailblazer as you trek across the Sahara in jeeps or astride a mighty camel. Embark on an otherworldly camping expedition under the grace of the open sky and the warmth of Berber culture. Hikers, skiers, and adventurers are drawn to the snowcapped peaks of the Moroccan High Atlas Mountains. The long-held home of the indigenous Berbers, who have called this region their own for centuries. On the slopes and base of the mountain, Berber communities are found with adobe settlements and a lively culture. Ait-Benhaddou, a UNESCO World Heritage Site, is a notable attraction because of its mud-brick facades and sites so enticing that it has been the filming site of classic movies such as Lawrence of Arabia and Gladiator. For centuries, the appeal of this magnificent port-city has been known to several empires and nations who have tried to reap the rewards of its prime location looking outwards into the Atlantic Ocean. The modern resort city of Essaouira is a sought-after travel destination for its gilded sand, historic fortifications, its relaxed atmosphere, varied marketplaces and picturesque homes. Known as Africa’s “Windy City”, Essaouira is a watersports enthusiast’s dream. Away from all of the fast-paced city life of Marrakech, Essaouira is emerging as one of Morocco’s hidden jewels. The Moroccan capital city of Rabat is the product of Morocco’s different influences throughout time and is a virtual time capsule that windows to the country’s unique past. Rabat’s Roman, Phoenician, Islamic and Colonial pasts are brought to life with the city’s historic sites. Homages to the late Mohammed V, who declared Rabat to be the nation’s capital after securing independence, can be seen throughout the city. Gaze at architectural wonders such as the Kasbah of Oudaias, a Middle Age fortress that overlooks the Atlantic Ocean. Take in the regal sights of the Royal Mausoleum and Hassan Tower, and the Royal Palace, the estate of the current Moroccan Royal family. Explore the ruins of the ancient Carthaginian necropolis of Chellah, that include Roman and Arabic buildings as well. Rabat delights the senses with its aroma-laced marketplaces, trendy cafes, restaurants and cosmopolitan flair. Explore the history and the culture of one of the most distinctive countries on earth, in luxury fit for a sultan. 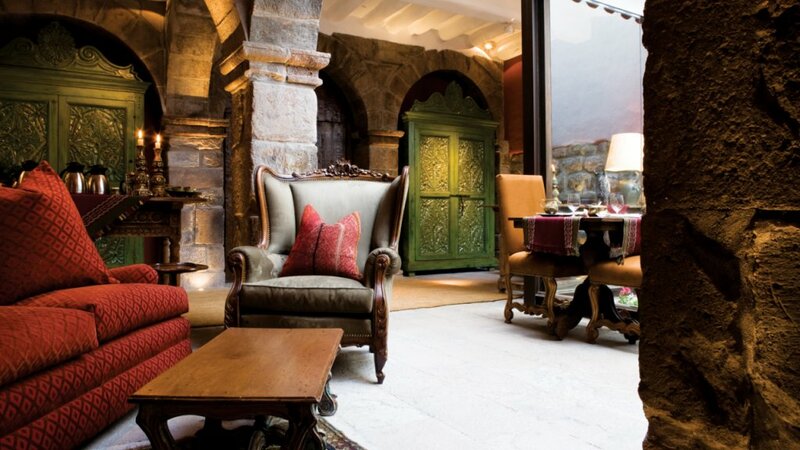 Featuring: Marrakech, Fez, The Sahara Desert, the High Atlas Mountains, Essaouria and Rabat.